When Sicily Coyne is in middle school, she finds herself in the midst of a giant fire. Her firefighter father saves her life, but loses his own. Sicily is left with horrific scars, even after years of surgery. Sicily has grown into a confident young woman in spite of her disfigured face. She is thrilled about her upcoming wedding to a childhood friend, until she learns a shocking secret about his connection to the day that changed her life forever. Her life is in shambles. The pain of betrayal compels Sicily to pursue a controversial surgery that could give her a new face. Jacquelyn Mitchard explores what would happen if someone who had been considered ugly and a social outcast for most of her life could become beautiful in just a few days. How would your life be changed? Would you be a different person? How would the people who have always been by your side react to you now? How do you perceive the new people who come into your life? There is a lot going on in this story. There are some very serious questions about medical ethics that Mitchard raises through this book. As an author, she does not answer them for the reader. Instead she invites you to consider the questions and come to your own conclusions. This is my first time reading a novel by Ms. Mitchard and I really enjoyed it. Her writing flows effortlessly and she excelled at adding new layers to the plot. I was surprised several times by where the story went. That being said, my favorite part was the character of Sicily. She is unlike any character I have ever experienced in a book. Many people would fold under such intense circumstances and hide from the world. Sicily has an acerbic wit that dares you to tell her that she cannot do what anyone else can. But it hides an intense vulnerability. She is a protagonist that you will admire and root for. My only disappointment is the ending of this book. I obviously don’t want to reveal it here, but suffice it to say that I don’t enjoy open-ended conclusions. After spending an entire book with a group of characters, I really want to know about their happy or unhappy endings. 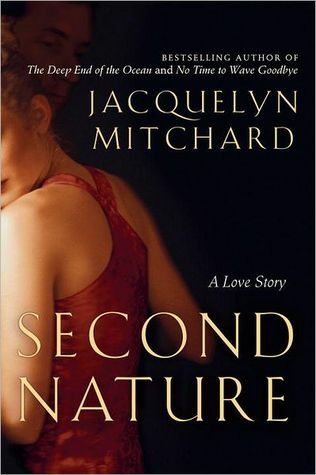 Second Nature: A Love Story is a great book that will have you speeding to the end to find out what happens to Sicily, a character who demands that you pay attention to her and her story. I would love to read another book by Jacquelyn Mitchard soon. Any suggestions? Excellent book, excellent review. I hope there will be a book to follow this one. I see that you haven't read this author before....you should really try "The Deep End of the Ocean" and then "No Time to Wave Goodbye", as many of the characters in this book, began in those two. Yes, I had heard that many of her characters show up in other books, so it will be interesting to see how they are different in earlier books.